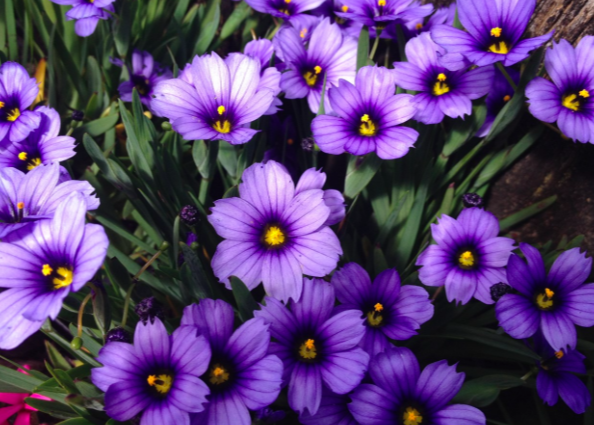 Remarkable and improved variety of this west coast blue eyed grass. Much larger flowers than the species are deep purple with a distinct yellow eye. Flowers appear continuously from spring into mid-summer. Rich, moist soil with regular irrigation in full sun prolongs the very showy flower display. To just 6″ tall and multiplying quickly to form colonies. This Blue Eyed Grass does NOT set seed and never becomes weedy Full sun. Good butterfly plant. Winter deciduous. The front of borders, rock gardens, hellstrips. Improves with regular irrigation. Oregon native plant.